The stars and the galaxies in the distant sky never cease to amaze us. From bursting nebulas to monstrous planets, from dreaded black holes to dust clouds, the universe creates and recreates itself every second. In this process, the universe gifts us with some really bewildering spectacles. In recent times, the scientists have really stepped it up with regards to the discoveries made in outer space. Let us take a look at the top 20 amazing recent space discoveries. Picture yourself sitting with an eye towards the outer space with a telescope. One would expect to see a mind boggling amount of stars and galaxies blending into each other to create a kaleidoscope of galactic beauty. And so did Robert Kirshner in 1981. But what he saw (or rather discover) was a complete void-an empty spheroid of space spanning over 250 to 350 million light years. On further analysis, it was revealed that the void contained only 60 galaxies. Let us put things into perspective-a void that big should contain at least 10,000 galaxies. Our galaxy, the Milky Way itself has 24 neighboring galaxies within a span of 3 million light years. So did the alien species destroy the planets in the Bootes Void? Or did they sell it off at an intergalactic market? 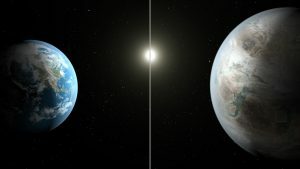 The scientists here on Earth have long been on a mission to find a planet as close in resemblance and properties as our Earth, for inhabitation. Earlier in 2015, scientist got their first breakthrough, when they discovered Kepler-452b. The planet is an exoplanet, meaning it revolves around a star other than our Sun, in a different planetary system. It boasts of a similar density and is only 20% wider than our Earth. Although temperatures might be mind boggling, with the highest measured temperature touching 2000 degree Celsius. Science has advanced the way we look at things. It has also increased the magnitude by which we could look at things. The universe is ever expanding and in the early 2000’s, scientists were able to look at images of thousands of galaxies which are 12 billion years old-as old as the Universe. Termed as “The First Frontier Field”, seeing the group of planets so far away was made possible by the photons travelling past Abell 274, another planet which was used as a lens. When we look at the Earth from the moon, or let’s say from the outer layer of the atmosphere, the sheer size of the planet can send chills down one’s spine. Imagine being in the same position of Jupiter’s atmosphere, which is 11.2 times the size of Earth. Scary? Wait for it. Imagine standing right next to Planet HD 106906b. 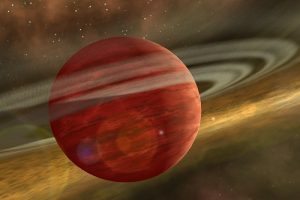 More than 11 times the size of Jupiter, it is a real monster planet. The planet is so massive and yet has its closest star 650 astronomical units away. The world is indeed a small place! Our sun is a big ball of fire and helium. Infact, the sun is so big and dense, that it contains around 99.86% of the solar system’s mass. Almost 1,300,000 Earth’s can fit inside the sun. But is it the biggest star known to mankind. No sir, no! 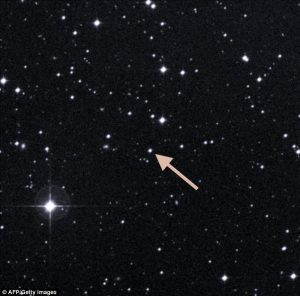 Meet VY Canis Majoris. 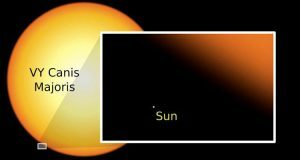 5000 light years away from the Earth, the Majoris can even humble our very own Sun. It is so big that inside it, you could fit 8 million Suns! Scientists come across various nebulas, supernovas, planetary systems and many other space mysteries every year. But this one really made them think. They have found a dust cloud near the heart of the Milky Way galaxy, which, believe it or not, tastes like raspberries and smells like rum. 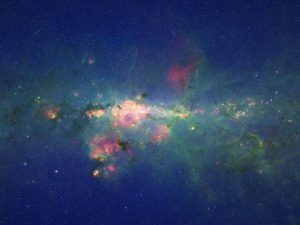 Termed as Sagittarius B2, the dust cloud is full of billions and billions and billions of litres of ethyl formate (which gives the cloud the taste and smell). A shout out to the alcohol guzzlers for sure! Just as children have dreams of a world overflowing with chocolate, Sultan of Brunei has dreams of a world overflowing with diamonds and sparkling studs. 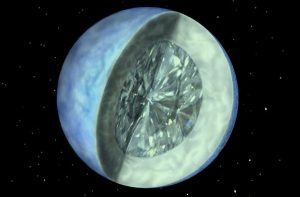 In 2012, scientists gave the Sultan some glimmer of hope when they announced the discovery of 55 Cancri e- an exoplanet some 40 light years away from the Earth in the Cancer constellation. Its surface is majorly made of diamond and graphite. Even the illustrations don’t do justice to this galactic beauty. Too bad that it is out of reach even for the Sultan of Brunei. If sold in a galactic market, it would fetch you 26.9 nonillion dollars (269000000000000000000000000000000 dollars!!). We have talked about planets and clouds of dusts being big and scary. Our Milky Way galaxy is one hundred thousand light years in width. This means if we watch anything happening from the opposite end of our galaxy, it actually took place even before the humans walked the face of the Earth. That’s pretty big, right? No! 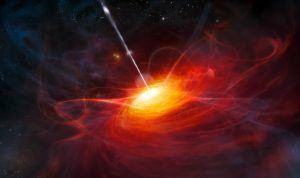 The Large Quasar Group has been touted as one of the biggest finds of the century. 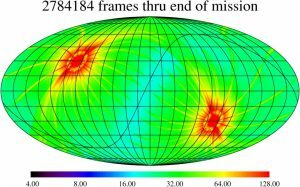 Multiply the dimension of the Milky Way by 40 thousand and now you have an idea of how vast the LGQ is! It is so vast, that it breaks the modern laws of standard astrophysics. Space 1, Science 0. At a safe distance of 12 billion light years away, we have the universe’s largest reservoir discovered by the scientists in 2011. It contains 140 trillion times the water in the oceans of the Earth. Imagine the scene from Interstellar, where the protagonists engage in a mission on a planet made entirely of water. The sad part though, is the fact that most of this water is in gas form and is more than thousands of light years in width and that too near a colossal black hole the size of twenty billion Suns. Looks like the problem of water shortage on Earth is here to stay. We should thank our stars we were born in a generation of the human race devoid of any galactic calamity. If you were born around 5 billion years, you could probably witness the end of our galaxy. 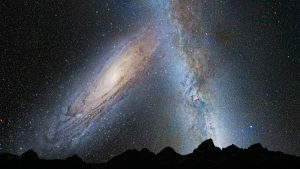 Due to advancements in the area of galaxy formations and movement, the scientists have discovered that in 5 billion years, the nearest neighboring galaxy, the Andromeda galaxy, would collide into the Milky Way, creating a merged galaxy where no new star formation is possible. The Earth could still be there, due to the fact that planets have huge distances between them. As we speak, the galaxies are spiraling towards each other at mind boggling speeds. When Einstein discovered the E=MC^2 equation, the whole world took notice. It became the most recognize equation of the world. But when the scientists and astronomy followers put the equation to test in outer space, they found a serious anomaly. 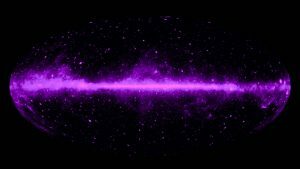 If Einstein’s equation holds true (and we have evidence it does), the matter we have discovered till date only accounts for 4% of the total mass in the Universe. So where is the rest of it? 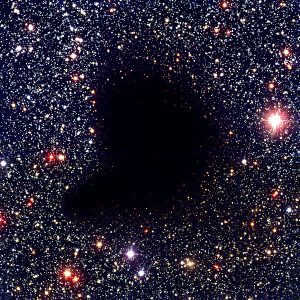 According to leading scientists, dark matter and dark energy could account for the vast majority of the mass in the observable universe. We again come back to the same question of what is the universe made up of. 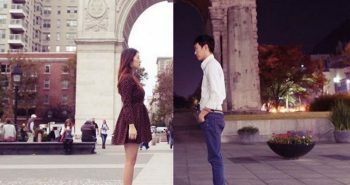 According to the standard laws of physics and gravitation, two huge planetary bodies like galaxies should attract each other because of their sheer size. But why do they not? 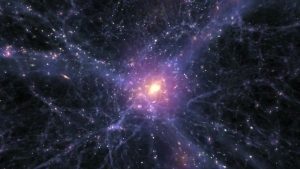 Why is the universe expanding? These galaxies are moving further apart and from this fact, the scientists have theorized the concept of Dark Energy. If it does exist, it covers and makes up nearly 74% of the universe, the rest covered majorly by Dark Matter. Apart from the dark energy and the dark matter that makes up the universe, there are certain special forces in action in the universe. 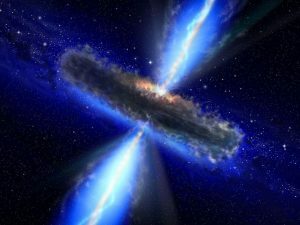 Patches of matter in the universe have been reported to move at fast speeds and that too in scarily straight paths. None of it could be explained by modern astrophysicists. Found in 2008, the scientists term this as the Dark Flow. They also hypothesize that this might be an effect of another universe pressing against our very own. But the theory also has its critics. Whose to tell which of them is right! When Pluto was removed from the Solar System officially, many shed tears. But back in 2005 the discovery of another planet just ahead of Pluto sparked continuous debates about the perquisites for spherical heavenly bodies to be planets of the solar system. 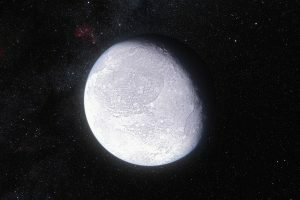 The Eris, named after the Greek god for strife and discord, is even ahead the Kuiper Belt and is roughly 28% larger than Pluto. Eventually, Pluto and Eris did lose out. As of today, Eris and its moon are the two most distant natural bodies of the Solar System. Water on planets has been the talking point of many a scientist over the years. While our moon is a barren planetary body, that is not the case with other moons in the Solar System. In 2013, it was confirmed that the chemical and physical properties of the moon of Saturn- Titan, matched those of pre-biological frozen Earth. Scientists have also found lakes on the moon of Saturn. But these lakes are very different than that on Earth. 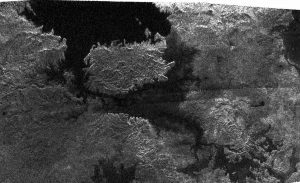 The lakes of Titan are filled with liquid methane and ethane, with temperatures dropping down to around -298 degree Celsius. Hurricanes and storms on the planetary bodies are not common. But the magnitude and timeline of some might just baffle you. Let’s take a look at Saturn’s hurricane on the North Pole. The hurricane is roughly 120 miles wide, almost the distance from Chicago to New York. It has been raging on for decades and has clocked winds of about 300mph. 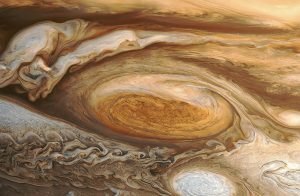 The hurricane on Jupiter is even more wild and also has a cooler name- The Great Red Spot. Raging on for more than 350 years, the spot of the hurricane has a radius equal to the size of the Earth. 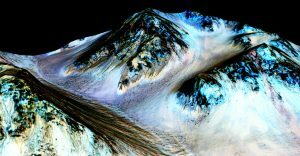 In what might just have been one of the biggest discoveries of this decade, the scientists finally confirm that liquid water does flow on Mar’s surface. Much of this water are minute traces and are mostly in the form of frozen ice. The place where the water ice is clearly visible is north polar ice cap. In the future, this discovery can help a lot in planning and executing manned missions to Mars and might even speed up the colonization of our neighbor. Remember Titan? The moon of Saturn is perhaps the most interesting of all planetary bodies in the Solar System right now. 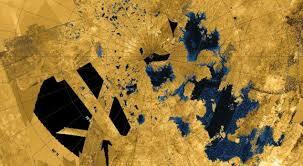 In 2013, the spaceship Cassini discovered a huge chunk of land mass coming out of the waters of Titan’s second largest sea- Ligeria Mare. Then it surprisingly disappeared back into the sea and months later reappeared. But the landmass was bigger and larger in size this time. From around 50 KM in size, it almost doubled to over 100 KM. Since then, the mysterious landmass has been given the name “Magic Island”. Remember that scene in “The Martian” where Matt Damon beats all odds and starts planting potato on Mars? Earthlings have made it possible. 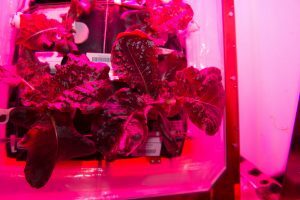 Thanks to the scientists of the International Space Station, the scientists up in space from now on could be munching on to some delicious red romaine lettuce. 2015 was a good year for the astronauts aboard the spaceship. This discovery meant that astronauts or future Mars dwellers from Earth would not have to carry food on their trip to Mars. And red romaine lettuce sure does taste delicious! Just days earlier, the NASA team confirmed that they have received signals from 540 million miles away from the Earth. 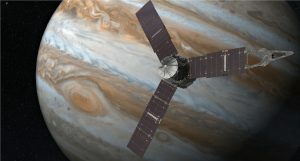 Juno had finally conquered the monstrous planet of Jupiter and was ready to reveal all its secrets. In the days to come, the spacecraft will look into the composition and properties of the planet and relay back the information to Earth. Researchers have stated that learning more about the planet will give valuable insight into how the Solar System was formed. But for now, welcome Juno! UY Scuti is a bright red supergiant and pulsating variable star in the constellation Scutum. It is a current and leading candidate for being the largest known star by radius and is also one of the most luminous of its kind. It has an estimated radius of 1,708 solar radii (1.188×109 kilometres; 7.94 astronomical units); thus a volume nearly 5 billion times that of the Sun. It is approximately 2.9 kiloparsecs (9,500 light-years) from Earth. If placed at the center of the Solar System, its photosphere would at least engulf the orbit of Jupiter. It was initially unknown whether 55 Cancri e was a small gas giant like Neptune or a large rocky terrestrial planet. In 2011, a transit of the planet was confirmed, allowing scientists to calculate its density. At first it was suspected to be a water planet. As initial observations showed no hydrogen in its Lyman-alpha signature during transit, Ehrenreich speculated that its volatile materials might be carbon dioxide instead of water or hydrogen. An alternative possibility is that 55 Cancri e is a solid planet made of carbon-rich material rather than the oxygen-rich material that makes up the terrestrial planets in our solar system. In this case, roughly a third of the planet’s mass would be carbon, much of which may be in the form of diamond as a result of the temperatures and pressures in the planet’s interior. Further observations are necessary to confirm the nature of the planet.